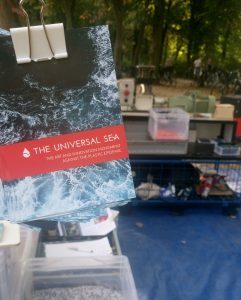 Last weekend The Universal Sea had the chance to meet some of the inspiring and enthusiastic team of the project ‘Kunststoffschmiede’ (plastic smithery) which is part of the Konglomerat e.V. from Dresden. They recycle plastic: first, the plastic has to be cleaned and sorted according to the consistency and afterward to be shredded. From this plastic granulate that emerges from this procedure, they make a new product by using an injection molding machine. With the help from precious plastic the ‘Kunststoffschmiede’ has built their machines from scratch. They also offer workshops and many other activities in order to save our beautiful world from the plastic invasion. If you want to find out more about the Kunststoffschmiede just click here. With this approach the ‘Kunststoffschmiede’ shows what a useful item plastic can be even after its primary purpose is already completed. To recognize that plastic is not an one-time-use-product is an important step. Properly recycled plastic does not end up in waters and landfills. Now and forever, the value of plastic in our society has to change. It should not be only a cheap and single used material but a very precious substance everyone has to use carefully.